See below for direct listings to these experienced folks, they are looking forward to meeting you and showing you around town! These locally owned companies are here to show you around town - from historic architectural tours to African American heritage trails to graveyard tours and everything in between, it's a great way to start your visit to Mobile! Whether by foot, bike, van, trolley, bus or Duck, we've got your sightseeing options covered. All of our sightseeing partners are available to help with customized tours, group outings and other creative ways to see the city, so be sure to ask if you've got special interests. We all have one thing in common - our love for our historic town - and we're eager to show her off! 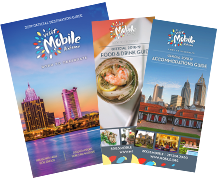 Pick up information on all of our Sightseeing options at the Visit Mobile Welcome Center at the History Museum of Mobile.